A Pratt University Art Student, a Volunteer Librarian, a "Grandmother for Peace," a Teamster, and an Ironworker. What Do They All Have in Common? 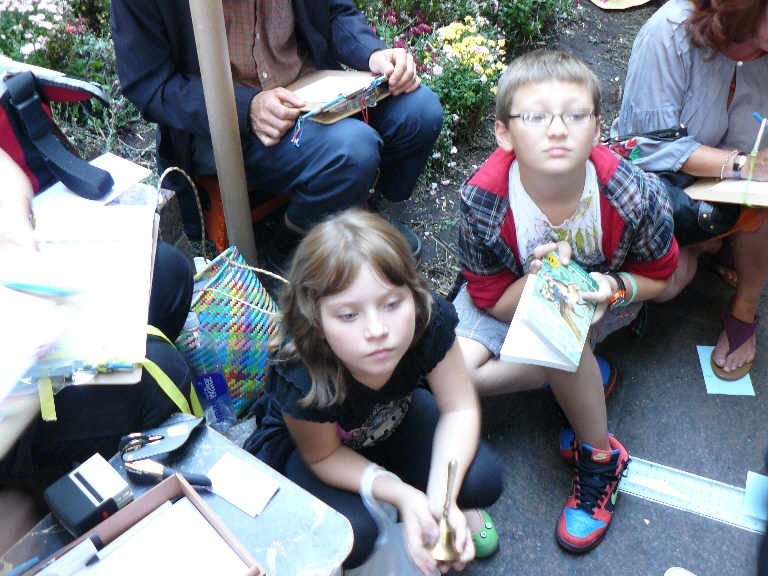 5 October: At the southern edge of the park, David and his friends Jess and Hannah were sitting on the floor, painting cardboard signs. The three eighteen-year-old Pratt University art students spoke about the exorbitant costs of university, the burden of student loans, and the reasons they had joined the protest. A continual roar of 20,000 marchers, who encircled Liberty Square, added a booming accompaniment to my animated conversation with David, who spoke in depth about his experiences here. Rob Couteau: So, why are you here today? David: I have homework; I should be at home! But they” (pointing to his friends) “wanted to come out. I’ve been here for a few weeks. I’d just come by when I could. When I first came out, it was one of the more inspiring moments that I’ve experienced in a long time. Because I’ve done activism, and I’ve done stuff before, and it’s always people angry and marching and just saying things. But this was the first time I could see action. I could feel the solidarity, power, and devotion behind the movement and the people. I went home, and that’s all I could think about. I was excited to come back, and I’ve been coming back ever since. This is a movement that's really important. Because you hear a lot in the media, people talking about all the problems we have, like, “Oh, it’s a hard problem to solve this,” or “It’s a hard problem to solve that.” But the truth is that they may be hard to solve, but they’re not hard problems to think of solutions for. It’s very clear. There’s an excess of wealth and a minority of people. If we redistributed that wealth, then so any of our problems, from abortion issues, to sexual assault, to poverty, to food issues, to economic issues, to war and violence: so many of those things could be solved by redistributing wealth in America. Many of these problems stem from our economic troubles. So, I’m glad that there are people out here, taking action. RC: Where are you from originally? D: I’m from Boston. Hannah’s from San Francisco, and Jess is from Long Island. RC: Is this your first day? D: No, I’ve spent the night here, two or three times. RC: You slept here all night? D: Yes. One night I didn’t plan on sleeping here; I just showed up. I was talking with so many people. It was about 5:00 in the morning, and there was a march. And I was like, “Oh, all right, guys, will you march with me? We’ll just stay till 9:00 or whatever.” That was the first night I was here; it was amazing. Then, a few other nights, I biked home and grabbed a sleeping bag. Actually, it was just a blanket. I was lucky; I didn’t get any rain. 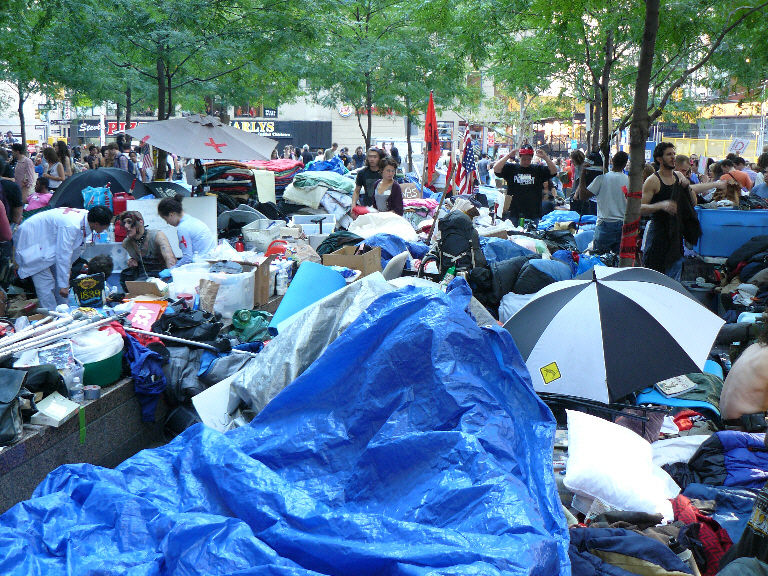 RC: You had a place to stay in Brooklyn, but you expressed solidarity and slept in the park all night. What’s the toughest thing about sleeping here? D: The hard ground. Otherwise, it’s actually very nice. There’s food, and everyone’s very friendly, including the police officers ninety-percent of the time. Even when they’re not friendly, they’re usually just passive-aggressive. I guess it’s hard because you’re sleeping on the street, but you feel safe. I can leave my stuff out, and I don’t have to worry about people taking it. This was before September 30, before there were so many people. I don’t know if the attitude has changed, but I doubt it. D: Yes! That’s what’s really exciting. This is the biggest progressive movement that people have seen since the ’60s. It’s really wonderful. 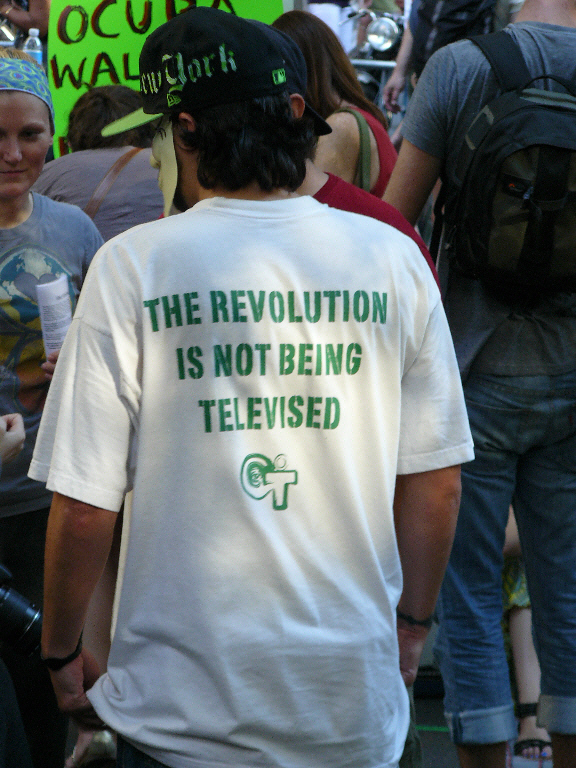 Because my generation, especially, is so pacified, and all about sitting on their asses, and turning on the TV. We expect things to be given to us. And it’s really nice to see people with privilege getting out onto the streets. Now, I’d like to see people without privilege doing the same thing. Because that’s who we’re fighting for. And it’s scary if it’s only people of privilege. RC: Are you and your friends an exception to your generation? 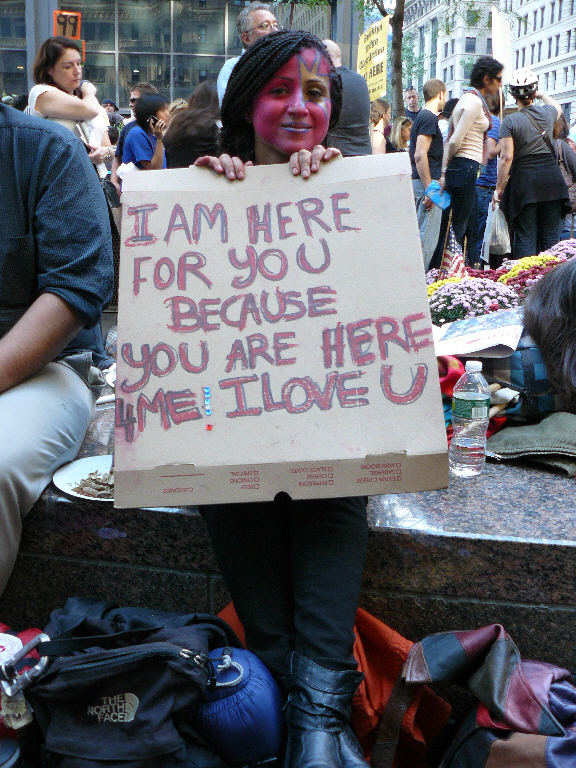 The fact that you’re offering your time and energy to come here and to lend support: are you an exception? Or are you in the avant-garde of your generation? D: I don’t know if we’re an exception. I don’t think I’d separate myself from my generation. But we’re lucky to have broken out of that, I guess. RC: Do you think your generation is more narcissistic than the ones that have preceded it? D: No, I think that we hate ourselves more. RC: But that’s part of the clinical definition of narcissism! D: Yes. Well, I don’t know. But I don’t think my generation is so by nature. Because we grew up and we remember what it was like not to have the Internet. That’s something that’s frightening. It’s scary, because we’re the last generation that’s ever going to know that. I think our generation communicates differently than other generations; thus, we have some issues concerning communicating and taking action. RC: So, you’re raising the issue of apathy, rather than lack of empathy, right? D: Exactly. It’s not that anyone in my generation is deprived or lacking anything; I think we’re just pacified. And I don’t know if that’s our fault. To a certain degree, I think we need to accept it. you are here for me"
I rememberin high school, in sophomore year I went through a conscious effort to kill my TV. I wouldn’t watch TV, no matter what. If I was in a room full of people and the TV was turned on, I’d leave. I’m not as intense about that as I used to be. But I think it’s really important to take on only the messages that you choose. And TV is pretty destructive. Our generation is given a lot more to entertain them, and given more in the vein of false consciousness. So, it’s significantly harder for us, more than any other generation, to liberate ourselves and to see the real issues in the world. In Hinduism, that’s like the veil of maya. It’s harder for us to take away the veil of maya, because there are a greater amount of things that distract us. That’s one thing I’ve been amazed at; the political ideas here are really dead on. One of the issues with the old Left is that it really was black-and-white. It was like: “Oh, I’m a Marxist” or “I’m a socialist.” And I’m not saying that’s where this protest lies, in the vein of Marxism or socialism. But I think people here are much less about separating things into categories. They see how everything connects: they see how all social issues are attached to different social issues, which is really important. Many people here look at things holistically, which is amazing, and something that most politics is really lacking. So, it’s exciting. It’s disappointing that movements like this don’t happen more often. But at the same time, it’s superinspiring when they do. Because when they do happen, they’re really thought out. People are considerate, and really make things better, using the tools that we have. RC: What will this lead to, in the end? D: The change that will come is a cultural change. That’s why I’m studying art. Because art is what determines culture. We need to shift the culture of apathy, which is brought about by technology, and change it to something that's a culture of activism. Which technology can be a tremendous tool for, but, right now, it’s being subverted, and it’s being used as a tool of pacification. RC: It’s not only your generation that's being tempted into this technological addiction via Internet and other forms of high tech. Even someone my age has to literally pull himself away from this technology. You know, in French, the word for entertainment is divertissement, to be diverted. RC: But for an artist, that’s not a true entertainment. An artist is involved in something much more profound. He doesn’t want to be diverted; he wants to be moved by an artistic product. Instead of creating objects of diversion, he’s trying to create heavenly objects. So, artists, especially, have to be careful about pulling themselves away from this technology, right? D: Yes. That’s one thing that upsets me about being at Pratt: how many people watch TV and spend their time on blogs and stuff. That’s what’s crazy about the Internet; it’s really a razor’s edge. On the one hand, it’s a tremendous tool of the people, right? Like free information, free participation: the masses versus everyone. It could be an amazing equalizer. Or, it could be an amazing tool for those in power, to oppress. RC: Anything else you’d like to add? D: I’m glad that you’re out here. It was great to talk with you! 8 October: Stephen Boyer is a twenty-seven-year-old volunteer librarian at Liberty Square. 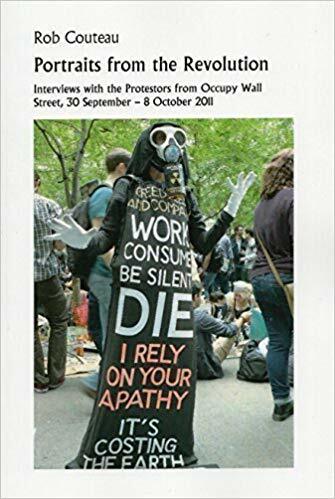 He’s also the editor of the Occupy Wall Street Poetry Anthology, which published its first issue three days after this interview. RC: Where are you from? Stephen Boyer: I grew up in Southern California, went to art school in San Francisco, and have lived all over the world. I’ve been in New York a year and a half. RC: How long have you lived overseas? SB: Off and on – a few months here, a few months there – about two and a half years. I just spent the summer in London. I returned about two and a half weeks ago. RC: How did you first hear about this? SB: My friend was one of the main guys at the info booth. I hadn’t heard about it, and, the night I got back, he was just going crazy with info about what was happening. I came the next night. RC: What day was that? SB: September 28. It was a rainy day; I wasn’t expecting much when I got here. But ten hours later, I was like: All right! [Laughs] And I’ve been coming here ever since. Now, I’m helping out at the library, and I’m doing a poetry assembly, every Friday night, on these steps. Last week, we had two and a half hours of open-mike poetry. This week, the library is giving us money to compile everyone’s poetry. Each week we’re going to start printing it, and I’m really excited about that. RC: What did you study at school? SB: Creative writing and sociology. RC: That’s sort of perfect for what you’re doing right now, isn’t it? RC: What made you decide to work at the People’s Library? SB: Last Friday, when I was setting up the poetry assembly, the poetry assembly had just been a part of the arts-and-culture working group, and I was hanging out with the librarians and talking with them about putting together a zine for the poetry people. And they loved it and wanted to give me money to print it. And then, I just fell in love with the library. It’s nice to have a person from arts and culture working on the poetry assembly, and someone from the library. It’s a good fit for me, because it kind of works with both groups. So, I’m here. RC: The last interview I did was with three eighteen-year-old Pratt University art students, who were here on October 5. 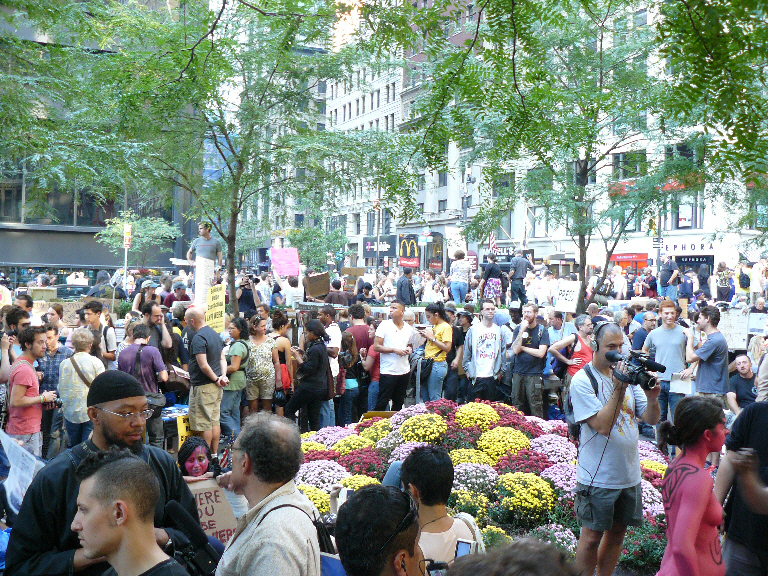 That was the day of the Foley Square rally. While I was speaking with them, I realized that there’s a big focus here on people who are interested in the arts. Would you agree? RC: In that sense, do you think this is a bit different from the rallies of the ’60s and ’70s? SB: Yes. It’s because a lot of people my age have gone to school to become an artist. Because, nowadays, if you don’t have an MFA, it’s really hard to be an artist and to be paid. But we’re all crushed with student loan debt; it’s impossible to live. So, as an artist, what’s happening here is right up on what we’re struggling with on a day-to-day basis. RC: I marched for the first time since 1979 on October 5; it was a very emotional experience for me. The girl I was marching next to was carrying a sign that had to do with the fact that she was an accountant and hadn’t found a job in over a year. And I chuckled to myself and thought of how, when I graduated in 1978, all my friends and I had art degrees. Which meant that we never really expected to find a real job. But now, even a person with a degree in accountancy doesn’t expect to get a job. Doesn’t that say a lot? SB: Yes. None of my friends who have gone to school really has a serious job. Everyone’s working in a restaurant or doing something sketchy: whatever they can do to make rent. I didn’t expect to come out of school and to be a billionaire or anything. But I expected to have some sort of security, and I don’t. RC: What’s the most special thing about being here? SB: I’ve been here for a few days now, and I started sleeping here, which I didn’t expect to do. If you come down, it kind of sweeps you away: the amount of diversity, the amount of different things happening. There seems to be something for everyone, whether you’re an artist, or into finances, or politics, or food, or whatever your interests are, there’s a place for you here. It’s like a new city inside one of the greatest cities in the world. This is where everyone that’s cool in New York is, you know? RC: What do you think all this is going to lead to? Where do you think we’ll be a year from now? SB: Hopefully, we’ll get an amendment to the constitution. There’s enough of an energy swirl so that we’re not just going to go down without something changing for us. Because now, we can see that we’re all equally angry and equally determined to change the course of what’s going on in this country. I don’t think it will stop until things change for the better. There’s more than one issue that we’re fighting for, and if we just picked one or two demands, we’d be pigeonholed as the people who wanted just one or two things. In fact, we want a lot more than one or two things. There are thousands of different demands, and I think they’re all worthwhile and should all be looked at. RC: Recently, there’s been an attempt to articulate a platform of issues that the group wants to focus on. I saw something about that on their Web site. SB: Yes. I know people are talking about creating a list of demands. And I think it’s good that we have some sort of direction here. I’ve talked to people from other local groups around the city. A lot of energy is being pulled away from groups that normally have a hundred volunteers, and now they only have five, you know? So, there does necessarily need to be something done with the amount of energy here. Otherwise, everyone’s projects that have been going on for years and years are going to fall through, all for this to do nothing but come to a big … you know, something should come. RC: I’ve seen protests come and go since the early 1970s, which was the last time there was a strong nationwide coalition. I’ve never felt as if any of them would really take off and light a fire across the country. But from the very beginning of this protest, I felt it in my gut. Did you also feel that way? SB: I felt it once I came down here. My friend invited me to check it out, and, before I got here I was pretty skeptical. Then, once I got here, I was surprised at how different it is from most protests. 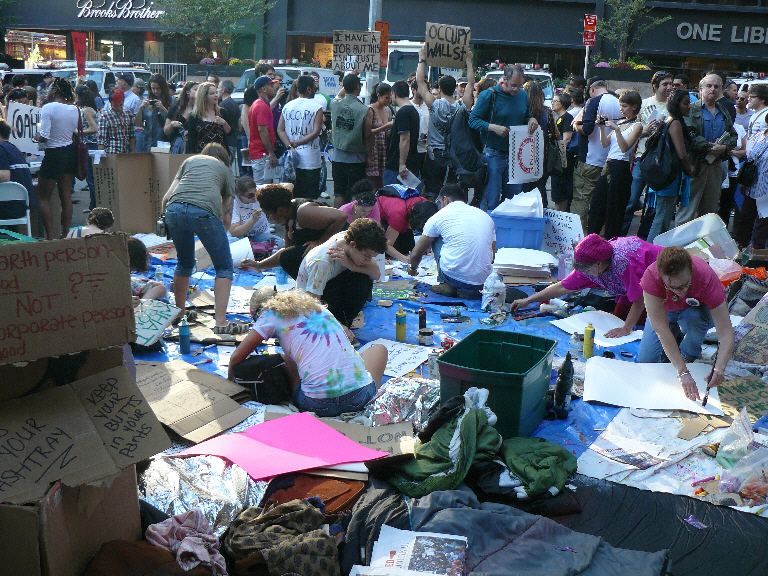 Most protests don’t feel as if they’re going anywhere in accomplishing anything. But, as I said, this is like a new city, and it feels like a new world could spring out of it. RC: Let’s talk a bit about that difference. It’s primarily a feeling, isn’t it? Isn’t it an emotional resonance for you? SB: It’s both a feeling and the organizational level and commitment that people are giving to it. People are committing their lives to it. They’re living down here; they’re working twenty-four seven to make things happen. It’s not just an afternoon march down a street. It’s twenty-four hours a day, seven days a week, till we get what we want. We’ve hit rock bottom in this country, and a lot of people here don’t have anywhere else to go. So, they’re just going to stay here and keep working together until something changes. RC: Is there one core issue for you? If you had to put your finger on one core issue, what would it be? SB: I feel that rich people who live or work in the buildings around us should give their money to the people in taxes, or in some form, to make sure that we at least have the basic standards that every human being should have. RC: When you say “rich,” how would you define it? Do you mean the top one percent? Or are you talking about people making over $250,000 a year? SB: For the sake of being here I’d say, yes, the top one percent definitely needs to give something. But I mean, my parents are upper middle class. They’re not necessarily in the top one percent, and they don’t do much; they could do more, that’s for sure. RC: One of the young men I spoke with who works in the audio-visual group said he came out of a Mormon background. Eventually he rejected it, but he kept a sense of direct individual spiritual experience: not an institutional, church type of spirituality. He feels one of the special things about this generation and the people in this protest is that many have lost a sense of meaning in life. And this event in particular is offering a sense of meaning to many in your generation. Because otherwise, all they’re offered is a culture that highlights and encourages narcissism, apathy, a lack of empathy, and a cause-and-effect way of looking at the world, rather than a more direct, meaningful experience, such as art offers, for example. Do you feel anything similar to that? SB: I do. When I came down here, the first big thing I felt was: happy that people weren’t just watching TV, or playing video games, or doing something isolated, alone in a room. Everyone my age has spent so much of his time isolated, alone in a room in a self-created prison of sorts. And it’s nice to be out, meeting new people, meeting all sorts of people, and learning new ideas. I’ve learned more this week than I probably did during a year in college. It’s really a beautiful, amazing thing. RC: That’s one of the great ironies of the Internet: the so-called Web. People talk about social networking, connectivity, being connected, and getting connected. But so much of it is about sitting alone, in an isolated room, under the blue “moonlight” of your monitor: being stuck like a fly on a web, cut off from people. But you feel that maybe this is an antidote to that, correct? Jenny was conspicuous in her bright yellow “Grandmothers for Peace” apron. While she took a break from her hectic schedule of activity, we spoke about the future of the movement. RC: You’ve been down here since the beginning? but can't feed the poor"
Jenny: Some of us were: a group of about fifteen to seventeen was here since the first day. 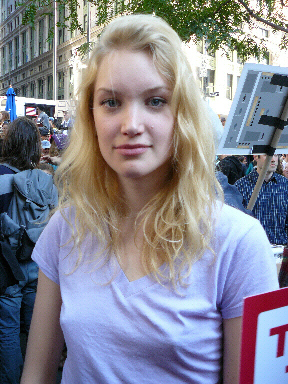 Three members were arrested at the Union Square rally, and other people have been arrested at other times. 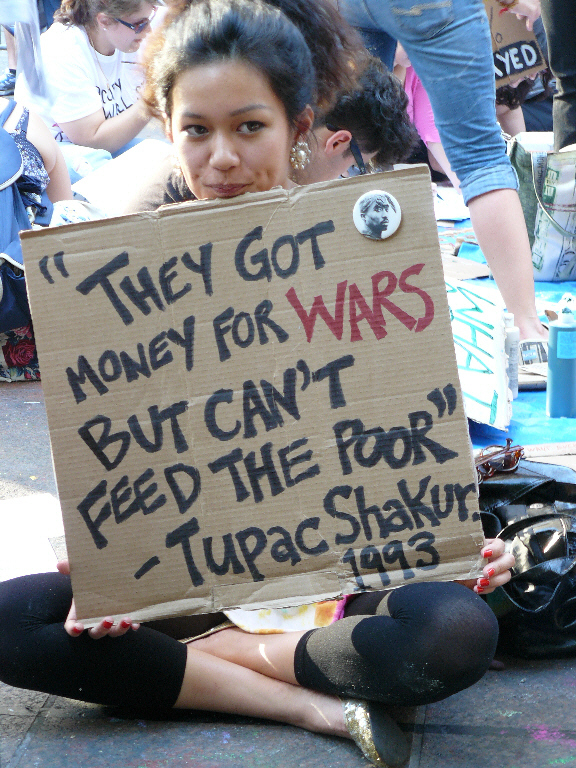 We feel very strongly about supporting Occupy Wall Street and about how our messages are all the same. RC: What are your impressions of the young people here? J: I’m so impressed by the energy, thoughtfulness, and commitment not just to goals but, more so, to a paradigm shift around communication and around discourse. There are any number of people here who are not on the same wavelength as I am. I mean, I’m not a Ron Paul’er; I’m not particularly into waving American flags or anything like that. But the fact is, their commitment is to deepening discourse and to not polarizing. When there’s a police action that is brutal – and they’ve been awful – the commitment after addressing what’s happened is, “Let’s get back on focus.” The other day we were yelling, “You are the ninety-nine percent!” to the cops. That’s really a significant thing to be supporting. When we hear antipolice comments, we can talk about “abuse is abuse,” but there are still policemen who are operating without contact who are part of us, you know? RC: A year from now, ten years from now, how will people talk about what’s happened here? J: I don’t think the change is going to be in my lifetime or in your lifetime. But, hopefully, the discourse will change over time. RC: Anything you would like to add? J: This is an amazing, wonderful experience, and we need to guard against it being co-opted. Someone said to me, “Oh, it’s too bad there isn’t a centralized group with a message.” And I almost had a heart attack. I said the strength of this is that it isn’t that. Any push toward centralization, or toward a hierarchal model, is in total opposition to what the strength of this is about. In terms of real change, I don’t think we’re going to see things in our lifetime. But there’s a different model out there; that’s what’s critical. And I believe that will go on. RC: This is also educating a lot of people. As it seeps into the middle class, they’ll be thinking about some of these things for the first time in their lives. 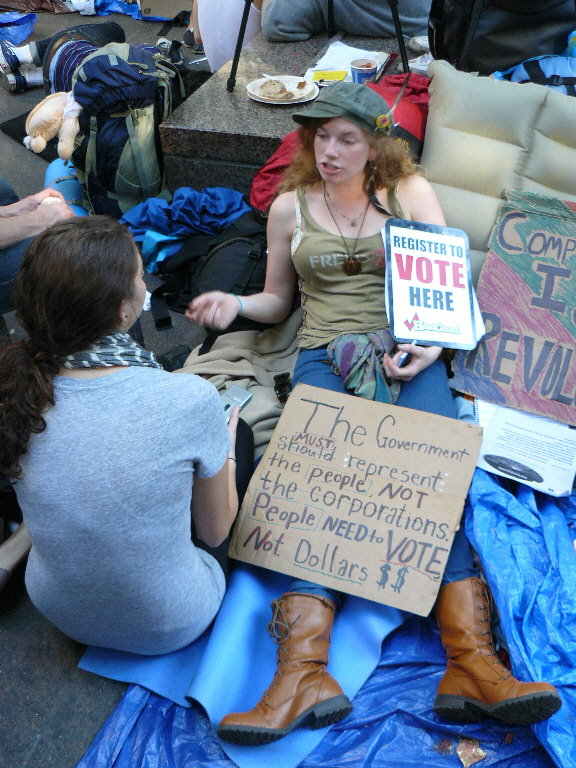 RC: On the Internet, I saw that there’s even an Occupy North Dakota! RC: So I thought, that’s got to mean something. I briefly joined a group of three union members, each about fifty years old, who were sitting at the southeastern edge of the park. Pete and David are Teamsters who work at Sotheby’s. Rob is a member of the Ironworkers Union. RC: So, why are you guys here today? Rob: I’ve been here because I’ve been waiting for this for three years. Ever since the bailouts of 2008 I’ve been angry, and I’ve been waiting for something to pop up, and now it’s popping up. RC: What union are you with? RC: And what about you? D: Yes, I’m fifty years old; I remember that. "The revolution is not being televised"
RC: When the body bags came back to the middle class, that’s when the bulk of the country got behind ending the war, because it was affecting the middle class. D: They shut that down now. You don’t even know what’s going on. It’s not in the news. They had a whole thing about how you can’t even see the bodies and stuff. RC: Ever since the Iraq War, it’s been illegal for journalists to photograph the coffins draped with the flags. R: Yeah, the hard-hat riots happened right there – two blocks away. R: I believe they were building the Trade Center. RC: So, you guys know what I’m leading to: the bashing of the heads of the hippies and so on. And I explained to these kids that when the unions joined the students in May 1968 in Paris, they almost brought down the government. RC: But it never happened here. This is an extraordinary story; we have unions and students, young people and old people, all working together. What do you guys think about that? Am I correct? R: Absolutely. Well, I’ll say one thing. You made me think of something” (turning to his friend Rob). “For years, in the union movement, we’ve been talking to our members about what was coming their way. We’ve been telling our guys about all the little things that happened in the shop, and the cutbacks they want to make, and the tweaking of the language, and messing with the contract. And they’re kind of asleep. It’s hard to wake them up and to get them to hear. But now it’s actually happening. And people everywhere else are understanding it. But the labor unions have been talking about it for years. So, it’s not new to us. 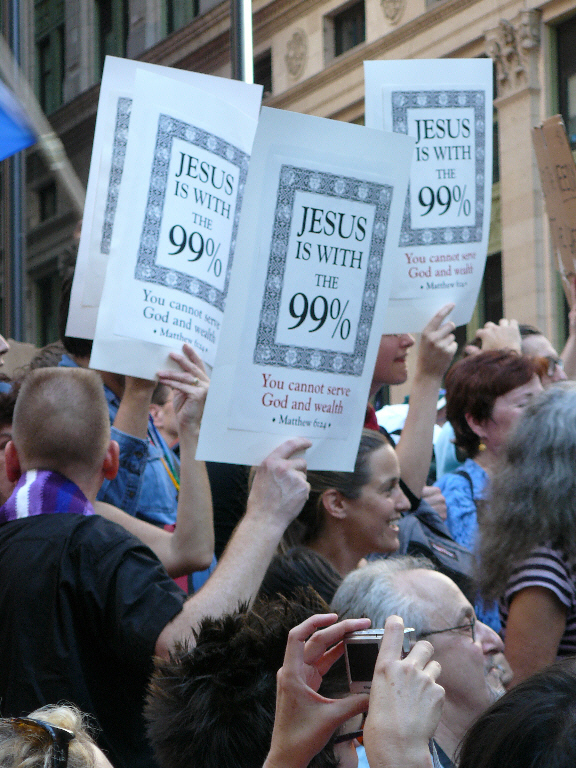 "Jesus is with the 99%"
But to specifically answer your question: look at us, and Pete here, and we got a few other guys who turned out today. We’re Teamsters, and we work at Sotheby’s. I think you heard about that. We’ve been locked out. 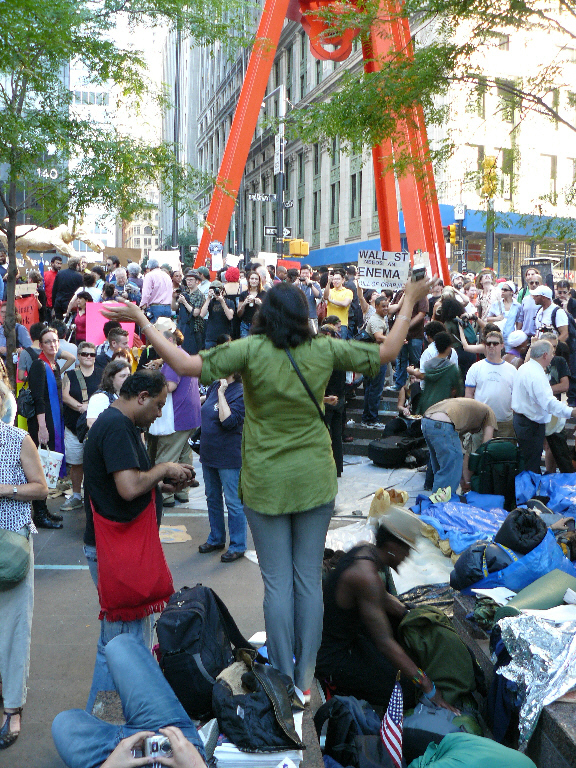 So, as a matter of fact, one of the very first things that happened during Occupy Wall Street is that some of these people, they knew about it somehow, and they came up there, and they went into the auction room and made a disruption. So, that’s how we became aware of this. Then we decided to come down, and to support them. RC: When that happened, what was your reaction? D: The guys thought it was great. RC: Why is it that you guys, and your fellow union members in your generation, have a different perspective about the protestors than the workers did in the 1960s? R: The thing that caused the split between the blue-collar workers in the ’60s was all kinds of social stuff, like long hair, rock’n’roll, and drugs. But now that’s all become part of the culture; that’s been accepted by everybody. For someone to have long hair isn’t shocking anymore. Half the construction workers have tattoos and look like freaks. So, that’s kind of been put behind us, and maybe we’re all getting together on the same page now, on the important issue, which is: making the system work for everybody.